Welcome to my stop on the Blog Tour for The Idea of You by Amanda Prowse. I'm a huge fan of Amanda's work and am thrilled to be part of this amazing tour. My Husband’s Wife and The Food of Love. look at the true meaning of love, family and motherhood. "With her fortieth birthday approaching, Lucy Carpenter dares to hope that she finally has it all: a wonderful new husband, Jonah, a successful career and the chance of a precious baby of her own. Life couldn’t be more perfect. But the reality of becoming parents proves much harder than Lucy and Jonah imagined after they suffer multiple miscarriages. Jonah’s love and support is unquestioning, but as Lucy struggles with work and her own failing dreams, the strain on their marriage increases. And when Jonah’s teenage daughter comes to live with them, Lucy is confronted with the truth of what love and motherhood really mean. Suddenly it feels like Lucy is close to losing everything." The Idea of You was inspired by Amanda’s own experience with miscarriage—one of which occurred while her husband was on tour in Iraq. Amanda maintains that the pain of losing multiple pregnancies has brought her family closer and made her appreciate her sons for the gifts that they are. I have no idea where to start with this review. A lot of you know my past struggles with miscarriage and the fact that I haven't been able to have children (so far...) and have been really supportive and kind to me. Amanda is one of those people too. I reached out to her after having read somewhere of her struggles and we connected. Reading any book about miscarriage, struggles to conceive or child loss is quite difficult, not just for me but for many women. Whether it's your reality or your worst nightmare, it's a hard subject. It's taboo and uncomfortable. It shouldn't be this way and Amanda Prowse is helping to break down these walls and make it ok to talk about. We aren't alone, none of us has to face this alone. So, back to my review. The Idea of You is not an uncomfortable read. It is heartfelt, real, emotional, funny and ultimately an uplifting story about female resilience and strength. Lucy is an amazing woman and I feel like I actually know her. She is kind but hurting. She's strong but broken. She loves her husband but hates their situation. All of these things make her every woman. Her spirit may be bruised but she continues to fight and hope for what she wants more than anything else in the world. I think this is part of her that many miscarriage sufferers will relate to a lot. When (if ever) do you say "enough is enough"? Jonah was an amazing character too. He was strong for his family. He was supportive even though his heart was broken too and he loved his wife so, so much that it warmed my heart. His vulnerability was real and I just loved them as a family. Thank you to Amanda and Simeon Prowse for sending me an advanced copy of this book in exchange for my honest review. Amanda is available for interview / to write about her personal story. Amanda Prowse is a bestselling novelist with an incredible 148K followers on Twitter. 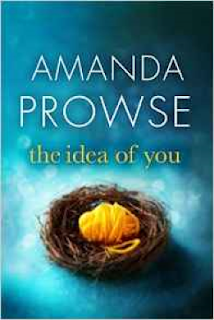 The Idea of You is Amanda’s seventeenth novel and follows her trademark style of writing about ordinary women and their families who find their strength, courage and love while being tested in ways they never imagined. ‘A truly amazing piece of drama about a condition that could affect any one of us in a heartbeat. ‘Uplifting and positive, but you will still need a box of tissues’ – Hello!